February 17 – April 15, 2018 Minimum 6 and maximum 10. We will read a film/book for one- two months and discuss the writing and the topic, but more importantly, reflect on how these (hopefully) new ideas inform our practice. These film/book discussions will not focus on critiquing the work as a piece of literature. If there is anything that bores me, it is a book club meeting that starts out with someone saying ”I liked it “ or “ I did not like it” and then everyone comes out swinging in defense of their position! Answer to a question I just received and that many of you may have. I have been doing this for so long that I forget that many may have not been communicating in this digital mode. I will have one Zoom meeting and then asynchronous discussions. This means you will come in at YOUR convenience from 6-60 (!) times and chat with those who are there. We will bring in other resources and ask and answer questions. I will be a facilitator. An optional F to F party in Minneapolis at the end of March. Invite others outside ACW! Hope this clarifies! 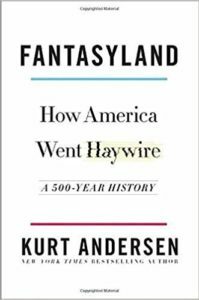 In this sweeping, eloquent history of America, Kurt Andersen shows that what’s happening in our country today—this post-factual, “fake news” moment we’re all living through—is not something new, but rather the ultimate expression of our national character. America was founded by wishful dreamers, magical thinkers, and true believers, by hucksters and their suckers. Fantasy is deeply embedded in our DNA. Over the course of five centuries—from the Salem witch trials to Scientology to the Satanic Panic of the 1980s, from P. T. Barnum to Hollywood and the anything-goes, wild-and-crazy sixties, from conspiracy theories to our fetish for guns and obsession with extraterrestrials—our love of the fantastic has made America exceptional in a way that we’ve never fully acknowledged. From the start, our ultra-individualism was attached to epic dreams and epic fantasies—every citizen was free to believe absolutely anything, or to pretend to be absolutely anybody. With the gleeful erudition and tell-it-like-it-is ferocity of a Christopher Hitchens, Andersen explores whether the great American experiment in liberty has gone off the rails. The purpose of these asynchronous virtual gatherings is to provide a safe place for a multi-generational/alternative perspectives dialogue. Getting into our “Like-Thinkers Silos” , as we call them, does not appear to effect much change. Kira Corser will lead the first discussions starting in February. This activity will give us the opportunity to get to know each other, work on our learning curves and build our community. Kira, and YOU, will be talking about Human Rights and Climate Change. Please send us reading recommendations. The Blazing World Siri Hustvedt A 60 something artist hires men to beard her work. Exit Through The Giftshop Bansky, River and Tides A documentary on Outsider Art. Who does she think she is? Pamela Tanner Boll A Film looking at women, mothering and art making. Living Proof: Telling Your Story to Make a Difference John Capecci A comprehensive guide to telling your personal story as an advocate for a cause or organization. Embrace by Taryn Brumfitt Embrace uncovers why poor body image has become a global epidemic and what women everywhere can do to have a brighter future. 13 Reasons Why Netflix Series “13 Reasons Why” tells the fictional story of 17-year-old Hannah Baker, a troubled high school student who takes her own life. She leaves behind a series of audio tapes describing the “13 reasons why” she did it. The themes are graphic and intense, tackling not only suicide, but also sexual assault and underage drinking. Very Controversial. Good topic for cross generational discussion. Artists need to encourage viewers to embrace cognitive dissonance. What does this mean? Why is it so difficult and why is it so important? Cognitive Dissonance occurs when what you believe to be true is in direct conflict with what you see to be true. It happens when you realize that your truth is A truth- not THE truth.In order to learn and remember, you generally have to physically “break” an old memory and put it together with a new one – a new synthesis. Learning occurs on top of old learning. It’s a physico-chemical process of creation. You don’t get what you had before. So most memories don’t stay the same for very long. They change.Brains are not collections of facts laced together into permanent storage, like DVDs. Memories are remade on the fly. Select Dialogue and drop down window Discussion Forum. Click here to raise your voice.